This hand crafted eco-resort, jungle lodge was built of local natural materials by artisans living along the Cangrejal river. Includes handmade furniture and original art, masterfully chosen, from the Honduras, Central American, region. The result is a masterpiece that will embrace and delight you. This operating, turnkey, boutique hotel/retreat has been lovingly and gently placed on 93 acres of lush, jungle clad mountain. Encompasses both sides of a crystal clear river, tumbling down over four spectacular waterfalls in easy walking distance. The river could be used for small hydroelectric power generation. Wooden bridges span the stream offering breathtaking views below. 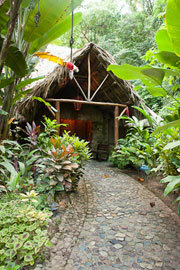 Paths meander under towering mahogany trees where toucans nest and rare orchids bloom. Includes swimming pool, bar, restaurant and dining pavilion. Use your imagination for endless opportunities: Healing center, spa, corporate retreat, bed and breakfast, river rafting (adjoins the large Rio Congrajal river as well), bird watching, wedding or honeymoon destination. Includes a two bedroom owners home on the River plus what could be five lots or additional cabin areas. 26 nearby additional cabin sites exist without touching the remaining approximately 90 acres above. Great development potential for fractional ownership as well. La Ceiba, only 20 minutes away, and a little over 2 hours flight from Miami, Houston or Atlanta is an internationally recognized eco-tourism destination. The world famous Pico Bonito Park is just across the adjoining river.